The largely nonspecific tutorial below was put together as part of design work currently featured in the Nanorex carbon nanotube gallery. This tutorial is/was meant to be introductory material for either engineers unfamiliar with chemistry or chemists unfamiliar with engineering, in either case not covering much material but providing some visuals and descriptions that highlight the complexities of designing simple nanosystems, avoiding any significant chemical or engineering jargon (and no equations). This is all related to the class project I developed as part of my travels to Clarkson University this past semester. Any more I would include here would likely overlap with the introductory material, so I will save additional explanations. While a final version will eventually make its way to the Nanorex website, I’m providing a first-pass (of the final draft) of the text and figures, having already sent out a copy to Tom Moore at machine-phase.blogspot.com, who’s doing an excellent job of putting the NE-1 simulator (and his own computers, given the number of machine problems he reports on!) through the ringer using carbon nanotube and diamondoid nanostructures. The two machine-phase posts to date related to the bearing assemblies on the Nanorex site are available at “simulation-update” and “revisiting-damians-bearing,” and I can’t wait to see what Tom winds up doing with them. If anyone has ideas, questions, concerns, comments, clarifications, etc., please post them to the comment section (to keep record so everyone can follow the thought process that will invariably have me scratching everything here and going back to the drawing board). Molecular manufacturing discussions often center on the differences between the stochastic processes of motion and synthesis in molecular biology and what, exactly, it means to be a deterministic assembly process with atomic precision. Instead of relying on the diffusion of vast numbers of small molecules within a cell, molecular manufacturing relies on the directed motion of structures and components that are designed, implemented, and predicted with greater precision than that of the world’s most sophisticated factories. An ideal nanoscale factory would operate with every atom accounted for, with every turn of a speed reducer gear calculable all the way from the cycle of the power source to the final evolution of a product large enough to pick up, pocket, and take with you. A real nanofactory will have a finite error rate, yet physical analysis indicates that errors can be limited to the molecular scale, and can be made extremely rare. The methods used in Nature for producing organisms many orders of magnitude larger than their molecular components is remarkable. In biofactory Earth, molecular self-assembly to perform complex functions (for the most part) occurs under environmental conditions that include simple, low-energy chemical reactions (the pervasive use of water molecules to break bonds or the removal of water molecules to form bonds) in the same liquid medium that is the feedstock and waste stream of these simplest chemical reactions (water), kept liquid by external energy (the sun), and facilitated by some of the products of these simple reactions (enzymes). The products of these biological processes (proteins and DNA) are simple chains, brought to function by motion and stability-by-proximity with neighboring molecules that bind together just slightly stronger than the individual components do with the aqueous medium. In biology, shape determines function. The fact that one process might not happen in the statistical bath of a single cell is made far less significant by the fact that the same series of events is occurring numerous times in the same cell. In a molecular manufacturing process modeled after macroscale engineering principles, the roles are reversed, and function determines shape. At the macroscale, bulk materials are shaped with manufacturing tolerances in mind and assembled such that the motion of parts in unison accomplishes some task. It is not enough to shovel the fragmented parts of a car engine under the hood and expect different results from the accelerator and the brake pedals, despite how well that same approach might work in a biochemical context. The design of a nanoscale engine requires meeting the same criteria as a macroscale engine, including exact component sizes, component interactions, and materials stability. It is at this point that the most underappreciated complexity of nanosystem design comes into its own. This complexity lies in the design process, revealing itself prominently in the nanosystem simulations that appear in the NE-1 gallery. This complexity arises from the limits of building nanoscale structures with single atoms and relying on the predictability of chemical bond lengths to generate manufactured parts. The issue is spatial quantization, the Cartesian manifestation of the quantum mechanical properties of electrons in bound atomic orbitals and their interactions with one another as atoms fill their valence shells by chemical bond formation. The arrangement of atoms in periodic lattices or symmetric nanostructures, like the high symmetry gears and bearings prominent in most all of the nanosystem designs to date, must be designed with their connectivity, and an understanding of the ramifications of overly-strained or valence-unsatisfied atoms, in mind. The problem is obvious to anyone familiar with Legos. When making very small structures (say, limited to 20 Legos), structural variety among products is very much limited by the possible connectivity of small rectangles. You cannot make a perfectly cylindrical tube out of a small number of parts, you can only hope to achieve a regular, rotationally-symmetric ring of these parts. Figure 1. Amino acid repeat sequence, showing three N-C-C-O units (red, green, blue). Biomolecules and most nanosystem designs do share one important feature: a standard repeat motif that generates the larger structure. In proteins, this repeat unit is the N-C-C-O of the amino acid, with side groups conferring functionality and additional stability in folded structures (Figure 1). In nanosystem designs, the repeat unit is used to create strongly connected structures. A simple demonstration of the limits of a design-space for a single repeat unit is shown for one small hydrocarbon repeat unit in Figure 2. Within the limits of all molecular mechanics methods, the rings are simple to generate and energy minimize. Like all such designs, however, there is an optimum number of repeats that yield a stable ring, an intermediate range around this optimum within which stable rings can be formed with some amount of strain, and then a range that exceeds the natural curvature, and the chemical bond strengths, of the repeat unit, structures to be considered both chemically and mechanically unviable. Alterative ring size generation, larger or smaller, necessitates the use of different repeat units, driving the development of new subunit motifs to expand flexibility in nanosystem design. Figure 2. The repeat unit used for the bearing in the low friction assembly and ring diameter as a function of repeat unit (12 to 16 repeats). Beyond the design of components from simple repeat motifs comes the design of functional structures, which requires combining simple parts based on these restrictions to form even simple devices. The presented low-friction bearing assembly is one such example, generated from two differently-sized rings based on the same repeat unit, a single-walled carbon nanotube, and a covalent framework to merge rod and ring. The design approach, and many of the issues that arose during the design process, are considered below. The first bearing assembly in this work (similar to the product in Figure 9) was studied using Chem3D/MM2 (design), NAMD/Charmm (calculation), and VMD (NAMD visualization) in 2004 (prior to Nanorex). All of the design and analysis work presented below (component optimization, defect analyses, ring-nanotube junction redesign, and molecular dynamics simulations) was performed using nanoEngineer-1 v0.8a. Figure 3. Bond lengths (1 – 4) in the repeat design that deviate furthest from their equilibrium positions with increasing/decreasing ring size. The position of this unit is shown relative to the 16-unit repeat ring at left. The rings of this bearing design were introduced above with the discussion of structure generation from small repeat units. The structural aspects of the completed rings important at atomic scales are the carbon-carbon bonds circled in Figure 3. These bonds are the ones most strained as the ring size deviates from ideality, making them the ones that contribute most to the change in ring strain as a function of included repeat units. The selected fixed ring in this bearing structure (repeat units = 14) is one of the better matches in diameter and symmetry with the carbon nanotube used as the backbone. The change to the diameter of the ring with each additional repeat unit is found to considerably reduce the range of options once the choice of nanotube is included in the design process, as detailed below. The repeat unit used in this ring design also makes available the covalent attachment of the rings to increase the height of the cylinder used in the movable component. The constraint of a fixed separation between rings in the covalent framework introduces yet another type of quantization in the design process, as the movable ring can only be elongated by increments of approximately 2.4 Angstroms (0.24 nm) after the covalent framework in the ends has been accounted for separately. This stepwise increase in cylinder height is shown for 1 to 5 stacked rings in Figure 4. Figure 4. Increase in cylinder height for the movable bearing fragment as a result of the addition of 1 to 5 individual rings. The structure at right is the original ring generated from the common repeat unit. The “ends” of the rings are approximately 0.46 nm wide). The atomistic representation shows that the ring perimeter now contains oxygen atoms (red) that connect each ring. The oxygen is employed as a replacement for nearest-neighbor C-H/H-C fragments that come into contact closer than the van der Waals radii of the hydrogen atoms. The oxygen atom replacement relieves a form of strain on the external side of the cylinder that would lead to considerable local instabilities in the cylinder and potential reactivity with hydrogen loss (Figure 5). This strain is a structural feature that can be modeled by molecular mechanics methods, but demonstrates an example of the importance of understanding the potential reactivity of atoms and structural units that goes beyond classical modeling approaches. Figure 5. C-H…H-C nearest-neighbor replacement with C-O-C to remove the hydrogen interactions. The backbone of this bearing design is a single-walled carbon nanotube, a class of material for which a wealth of information is available. The primary concern for this particular design is the melding of two rings to a single carbon nanotube to generate the “locked” portion of the bearing. As another material with a finite possible connectivity to other nanostructures, the choice of best nanotube for this application comes down to identifying a “best-match” in diameter and chirality with the locked rings. The honeycomb structure of the carbon nanotube, and the six-fold symmetry of these building units to generate the cylindrical structure, imposes significant constraints on the choice of nanotube for the backbone. 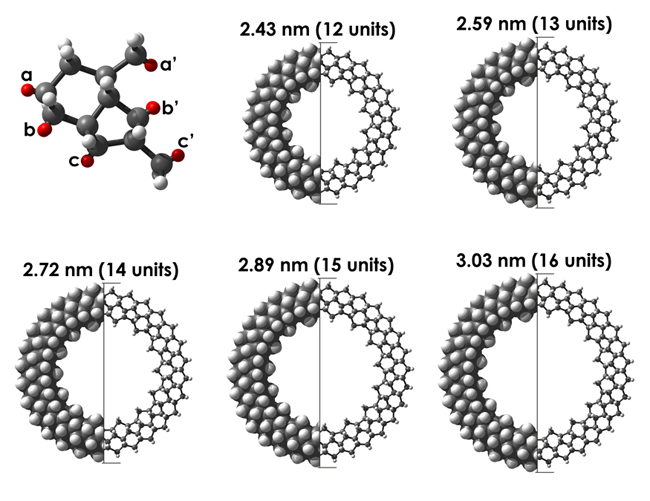 Neglecting much of the complexity in the nanotube selection, the diameter of the ring is largely a function of the number of six-member rings it takes to wrap around the nanotube, while the available connection points to the rings are determined by the chirality, or manner of wrapping, of the nanotube. Four choices that yield very similar diameters are shown in Figure 6. By inspection, the (14,0) and (7,7) nanotubes provide uniform ends with which to easily design ring connections. While (7,7) nanotubes can also work in this bearing design, the (14,0) nanotube is chosen to continue the design process. Figure 6. Single-walled carbon nanotube choices (including chirality (n,m) and diameter) for the backbone of the bearing assembly. There is an almost ideal match in diameter and connectivity between the 14-fold small ring, the (14,0) nanotube, and the chemical junction being used in this bearing design to covalently link the two. This section addresses the covalent assembly of these parts to generate the “locked” portion of the bearing. It would be peculiar to refer to the chemical modification of carbon nanotubes as a “recent discovery,” given that the field is not yet out of its teenage years. The modification employed here is still beyond the current abilities of the experimental laboratory, despite efforts taken here to generate as chemically realizable an approach to bearing formation as possible from a “synthetic chemistry” perspective. The key requirement at this step in the design process is the inclusion of connections to the ring from the nanotube that must occur normal to the nanotube surface at each junction. An initial design, based on the use of 1,4-substituted (para) benzene rings, provided the correct geometry for connectivity to the rings but at the expense of structure-deforming steric/pi-electron repulsion among the closest rings, shown for the end-functionalized nanotube in Figure 7. Figure 7. Initial benzene design for ring/rod covalently assembly. The molecular mechanics calculation reveals that steric crowding among the benzene rings keeps the structure from being a useful design for the bearing assembly. The covalent bonding of ring and nanotube is performed by way of a simple organic junction. 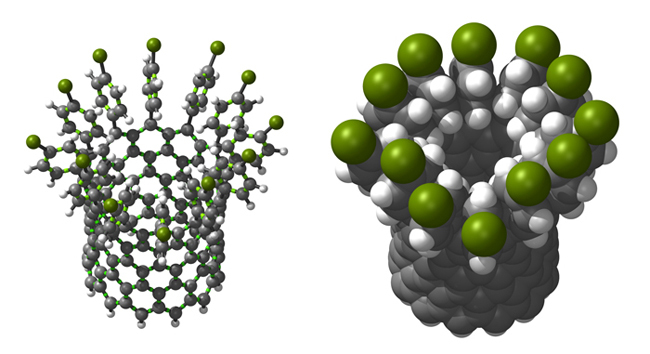 This junction may be perceived as being a modification to the nanotube framework or a ring-mounted connection point into which nanotube fragments are added to form covalent bonds to fix nanotube to ring. The O=C-C=O (ketone) fragments on the ring not only remove potential steric crowding that might arise with bonding to the nanotubes, but also introduce a potential route to the assembly of the ring and the nanotube that marries chemical reactivity and mechanical positioning. The process is shown in Figure 8 for one such reaction (repeated 14 times at each ring/rod interface) with captions describing the process at each step. Figure 8. 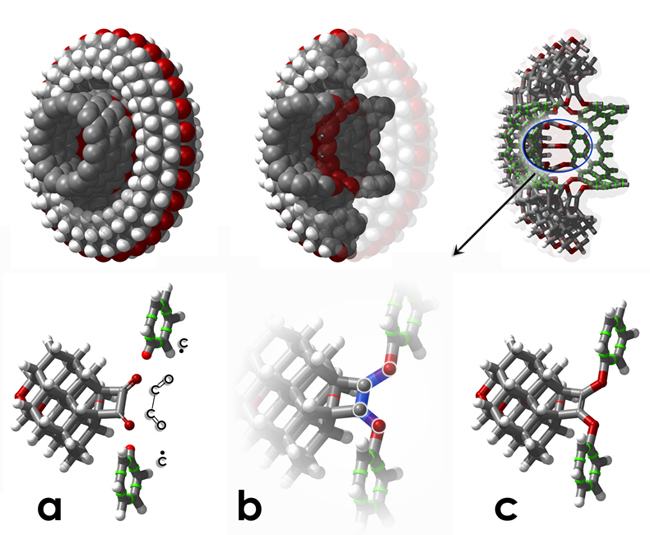 Top: Covalent assembly of the ring and nanotube rod components (van der Waals, cut-away van der Waals, and cut-away tube views). (a) The ring with O=C-C=O fragments along the inner diameter at each repeat unit and a valence-unsatisfied nanotube end. (b) Covalent bond formation occurs through a rearrangement of the O=C-C=O pi-orbital system to generate (c) a C(nanotube)-O-C=C-O-C(nanotube) junction. The covalent framework of the ring/rod assembly is completed with the addition of a second ring to the nanotube backbone at a separation best suited to minimizing floppiness in the motion of the movable ring while allowing for its relatively unrestricted rotation. The end of the design process yielded the basic structure shown in Figure 9, complete with the “locked” ring/rod assembly (14-fold rotational symmetry) described above and a movable ring with 15-fold rotational symmetry. The process of determining ideal movable ring size, locked ring – locked ring separation, and other remaining design issues are considered below. Figure 9. The complete low-friction bearing assembly, shown in cutaway (left), exploded (middle), and assembled (right) views. In the colorized versions, the blue/green segments are the covalently attached “locked” structure and the red ring is the “movable” structure. * The movable ring must not have the same rotational symmetry as the locked rings, as commensurate ring structures may “stick” at symmetric points. This is a more significant issue when the separation between locked and movable ring is too small and the van der Waals packing leads to strong ring-ring interactions, but may not be problematic if the energy difference between locked and unlocked is sufficiently small. The example of potentially “sticky” interfaces in rotational applications are shown for a smaller, 12-fold symmetric bearing assembly in Figure 10. Figure 10. Commensurate ring-ring structures, with the potentially problematic hydrogen atoms on the fixed (blue) and movable (red) rings emphasized. In these ring systems, two sets of hydrogen surface interfaces exist (outer at left, inner at right). * The inner diameter of the movable ring must be sufficiently large to not crimp the nanotube, as this change to the nanotube shape increases the strain of the system and reduces the locked ring-locked ring separation (Figure 11). Further, the ring-nanotube packing must be tight enough to maintain the movable ring orientation and reduce its translational floppiness. It is at this point that simple chemical replacements in the movable or locked rings can be performed (replacing C-H fragments with N atoms, replacing O atoms with S atoms to increase separations in the rings themselves) to modify the overall fit of the rings (see below). Figure 11. Nanotube crimping by the movable ring as a function of repeat unit count (13, 15, 17). * has an inner diameter of 1.40 nm, a distance that is a reasonable match for the nanotube backbone (the 1.10 nm diameter reported in Figure 6 is an atom center-to-atom center distance. The effective diameter is dependent on the extent of the nanotube pi-system. See the Methods section below). * is 1.10 nm wide with only the single movable ring repeat unit (including the van der Waals radii of surface hydrogen atoms, a reasonable width for the 1.04 nm separation of the locked rings). The ultimate decision on a sulfur-containing movable ring is a result of other, minor structural modifications to the simple repeat motif of the other rings. Some potential modifications are shown in Figure 11 with the thought process for the final design considered here. The final ring design is a function of (a) the number of repeat units and (b) the inner diameter of the ring and how it interacts with the nanotube. 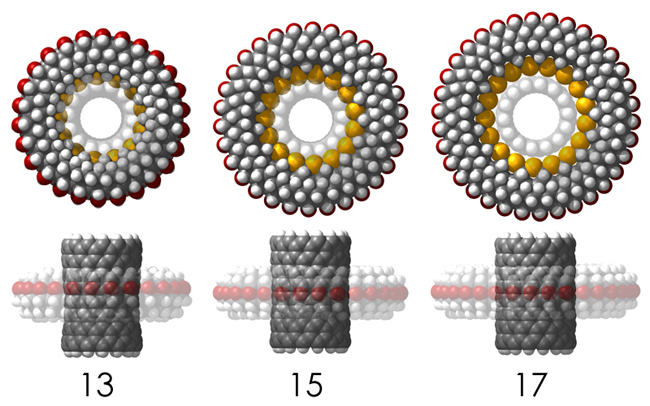 The unmodified 15-fold ring structure has an inner diameter of 1.56 nm, a value too large for the (14,0) nanotube. The best fit in unmodified movable ring for the bearing assembly is the 13-fold form, a ring size that begins to push into the “destabilized” regime relative to strain in the repeat unit interactions. Given the need to utilize a rotational symmetry incommensurate with the locked 14-fold rings, the logical decision is to perform structural modifications to the base 15-fold ring to reduce the inner diameter and, therefore, reduce the potential translational motion (sloppiness) of the movable ring. The redesign process is also summarized in Figure 12. Figure 12. 15-fold movable ring redesign for the bearing assembly. From the original ring (Hydrogens), nearest-neighbor hydrogen atoms are removed, leaving single carbon atoms (Bondpoints). The transmuting of these carbon atoms to oxygen atoms (Oxygens) doe not significantly alter the inner diameter of the ring. The addition of sulfur atoms to neighboring bondpoints (Sulfurs) reduced the inner diameter to a value reasonable for the bearing assembly. There is an issue that is not directly addressed by nanoDynamics-1 or most any other classical mechanics-based atomic simulation method that does have significant consequences for nanosystem design (both here and generally). This is the inability to determine chemical reactivity from the theory. Reactivity in chemical systems is, at its simplest, a result of energy promotion, the process of overcoming an energy barrier height (“transition state”) between reactants in their “ground state” and “new products” (Figure 13). When chemists consider reaction pathways, they do so by assuming that the molecules are in their “ground state” and that the reaction occurs by introducing enough energy for the molecule to reach its “transition state.” From that vantage point, an enzyme or catalyst is designed to reduce the energy difference between these two states by either reducing the energy of the transition state OR changing the geometry of the molecule in its ground state to some new “strained state.” In many nanosystem designs, chemical bonds are strained from their “ideal” distances due to the geometry of the components (such as considered in Figure 3), meaning that these bonds are more likely to break (although this likelihood may only increase by some small fraction) with the introduction of energy (“dissociation,” Figure 13). This energy introduction may take on the form of high-energy photons or chemical collisions and “grinding” components in these mechanical nanostructures. They also may take the form of ring strain (Figure 3) or repulsive interactions due to inappropriate spacing of components (sulfur-nanotube spacing, Figure 11), instances that can be accounted for during the simulation process. Figure 13. Left: A reaction diagram describing the influence of “strain” on a reaction pathway. Right: The influence of “strain” on covalent bonds in nanostructures. In both cases, the introduction of “strain” (from the covalent framework of the components themselves or the repulsive interactions that occur when components are too closely-spaced) increases the reactivity/decreases the stability of the system. The energies associated with these events, and the energies required to break the bonds in these structures, cannot be determined by molecular mechanics methods but can be predicted using quantum theory. Unfortunately, the processing power required to adequately perform quantum chemical calculations on systems this large are available only in the fastest supercomputers. 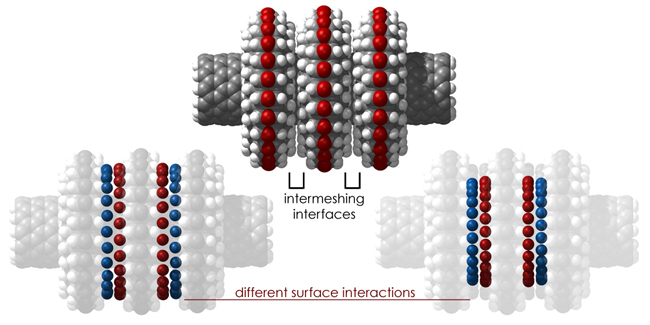 It is for this reason that design approaches beginning with molecular mechanics methods are invaluable in nanosystem design, as studies of component fits, identifiable steric interactions, and potential chemical reactivity based on observed strain in simulations can be determined rapidly, allowing for optimization cycles in a system design before beginning the more resource-demanding studies of electronic structure.